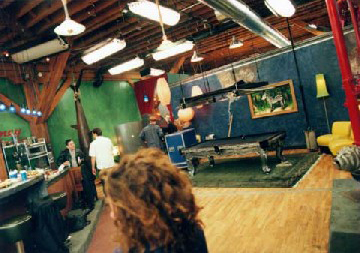 The Billiard Room in Pier 70. The pool table lights served as the lights in the up position and as a guest bed (with mattress) when lowered. In this picture, you can see that the walls of the Bedrooms located east of the Billiard Room did not extend up to the top of the Pier. The zebra painting on the wall could be raised to provide a window into the Blue Bedroom. The view of the Billiard Room from the Entryway. The southern side of the Billiard Room next to the Entryway. In this picture, you can see the small fishing hole located next to the red pipes in the floor of the Pier. 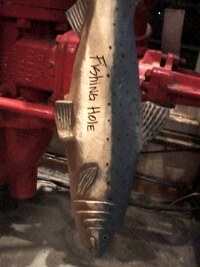 The fishing hole provided direct access to Elliott Bay.